Ever wish you could mix an Old Fashioned just the way Don Draper likes it? Or prepare Oysters Rockefeller and a martini the way they did fifty years ago at one of Roger Sterling’s favorite haunts, The Grand Central Oyster Bar? Ever wonder how Joan Harris manages to prepare a perfect crown roast in her tiny apartment kitchen? Or about the connection between Jackie Kennedy’s 1962 White House tour and Betty Draper’s Valentine’s Day room service order? 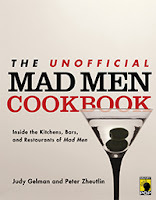 The Unofficial Mad Men Cookbook serves up more than 70 recipes to satisfy a Mad Men appetite! From the tables of Manhattan’s most legendary restaurants and bars to the Drapers’ Around the World dinner, this book is your entrée to the culinary world of Man Men-era New York. Packed with period detail, The Unofficial Mad Men Cookbook provides invaluable historical and cultural context for the food and drink featured in the show, tips on throwing a successful ’60s cocktail party, and even a guide to favored Mad Men hangouts. Every recipe inside is authentic to the time. Whether you’re planning a Mad Men-themed dinner party or just can’t get enough of the show itself, this is your essential resource, a guide to all foods and drinks Mad Men. So hang up your coat, pour yourself a cocktail, and get ready to dine like Draper and drink like Sterling with The Unofficial Mad Men Cookbook. One of my guilty pleasures (besides reading) is watching the television series Mad Men. My husband and I are addicted to this show and I don't think I've missed a minute of this series. I truly think it's one of (if not the best) shows on television. It seems like I've been waiting forever for the new season and I'm definitely ready for it. So when I recently saw in Entertainment Weekly that the cast had begun filming again, I was positively giddy! I provided all of that background about my love for the series Mad Men because it will help to explain why I'm reviewing the book that I am today. 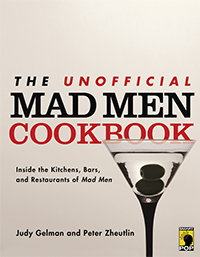 It's called THE UNOFFICIAL MAD MEN COOKBOOK: INSIDE THE KITCHENS, BARS, AND RESTAURANTS OF MAD MEN by Judy Gelman and Peter Zheutlin, and I have to say I thought it was a great concept... especially for big fans of Mad Men. Basically, THE UNOFFICIAL MAD MEN COOKBOOK is a cookbook filled with many of the recipes from foods served on the show; however, it's also so much more that. Each recipe includes a summary of the season and episode in which it appeared as well as a very detailed explanation of the recipe's origin. THE UNOFFICIAL MAD MEN COOKBOOK is organized like a traditional cookbook. It is divided into the following chapters: Cocktails, Appetizers, Salads, Main Courses, and Desserts and Sweets; and it includes more than 70 recipes. Quite a few of the recipes appear courtesy of the restaurant in which they were featured on the show, but there are also some character favorites like Sally's French Toast and Betty's Turkey Tetrazzini. I also really liked the section at the end which provided a list of Mad Men haunts. While I found many of the recipes to be interesting, I think my favorite thing about this cookbook is how it references the Mad Men characters and 1960s pop culture. It's apparent that the authors spent a great deal of time researching not only the show but also that time period. I was impressed that they even included some recipes from famous cookbooks from that time period such as the extremely popular Julia Child's Mastering the Art of French Cooking. Furthermore, I loved that they paid attention to even the smallest details. For example, they even went so far as to imagine what types of cookbooks the various characters would use. I have to say that this cookbook helped fill the Mad Men void that I'm been experiencing ever since last season ended. I had a great time reading about the Mad Men scenes as well as the history of many of the restaurants. This might sound a little strange, but I'm actually considering throwing a Mad Men party and serving many of the recipes from this book. Wouldn't that be so much fun? I highly recommend THE UNOFFICIAL MAD MEN COOKBOOK for fans of Mad Men or readers who are interested in early 1960s culture. You will not want to miss out on this very fun (and very informative) cookbook. You can follow the book on Twitter (@DineLikeDraper) and on Facebook. Thanks to the author for providing a review copy of this cookbook. I like 1960's culture, but I've never seen Mad Men. I am so out of it. The cookbook still sounds fun to me. Fantastic review, and great sounding book!! Thanks so much. If I didn't already have a collection of cookbooks from this era, I might hunt this down more vigorously! Ah, may need to anyway! Thanks for mentioning it. I haven't seen Mad Men either, but my parents love the show. Sounds like a fun cookbook. I hope you don't mind that I've linked you to Weekend Cooking.